Corporations listed in the Eurozone nations are clearly being penalized relative to their Western European counterparts outside the Eurozone. Here are the year-to-date returns by country. 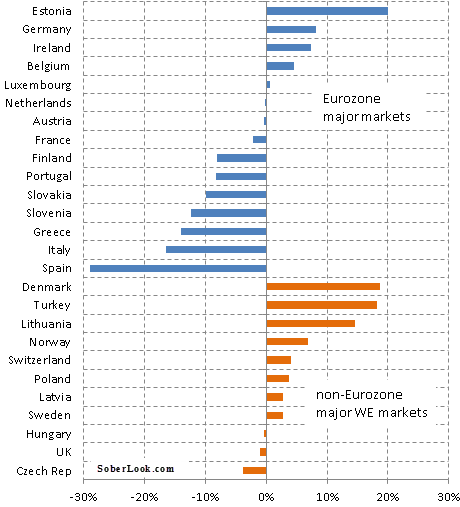 And it's not limited to the Eurozone periphery. Take for example the Nordic markets. Denmark, Norway, and Sweden are up, while Finland is down. Year-to-date, on a capitalization weighted basis, Western European markets not using the euro have outperformed the Eurozone markets by 5%. Of course if the currency changes are taken into account, this divergence is much higher.